Flow cytometric analysis of HeLa cells using mTOR (7C10) Rabbit mAb (Alexa Fluor® 647 Conjugate) (blue) compared to concentration matched Rabbit (DA1E) mAb IgG XP® Isotype Control (Alexa Fluor® 647 Conjugate) #2985 (red). 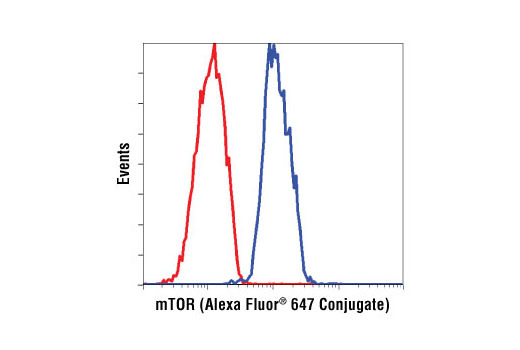 mTOR (7C10) Rabbit mAb (Alexa Fluor® 647 Conjugate) detects endogenous levels of total mTOR protein. Monoclonal antibody is produced by immunizing animals with a synthetic peptide corresponding to residues surrounding Ser2481 of human mTOR protein. This antibody was conjugated to Alexa Fluor® 647 under optimal conditions with an F/P of 2-6. This Cell Signaling Technology antibody is conjugated to Alexa Fluor® 647 fluorescent dye and tested in-house for direct flow cytometry in human cells. The antibody is expected to exhibit the same species cross-reactivity as the unconjugated mTOR (7C10) Rabbit mAb #2983. The mammalian target of rapamycin (mTOR, FRAP, RAFT) is a Ser/Thr protein kinase (1-3) that functions as an ATP and amino acid sensor to balance nutrient availability and cell growth (4,5). When sufficient nutrients are available, mTOR responds to a phosphatidic acid-mediated signal to transmit a positive signal to p70 S6 kinase and participate in the inactivation of the eIF4E inhibitor, 4E-BP1 (6). These events result in the translation of specific mRNA subpopulations. mTOR is phosphorylated at Ser2448 via the PI3 kinase/Akt signaling pathway and autophosphorylated at Ser2481 (7,8). mTOR plays a key role in cell growth and homeostasis and may be abnormally regulated in tumors. For these reasons, mTOR is currently under investigation as a potential target for anti-cancer therapy (9). Sabers, C.J. et al. (1995) J Biol Chem 270, 815-22. Brown, E.J. et al. (1994) Nature 369, 756-8. Sabatini, D.M. et al. (1994) Cell 78, 35-43. Gingras, A.C. et al. (2001) Genes Dev 15, 807-26. Dennis, P.B. et al. (2001) Science 294, 1102-5. Fang, Y. et al. (2001) Science 294, 1942-5. Peterson, R.T. et al. (2000) J Biol Chem 275, 7416-23. Huang, S. and Houghton, P.J. (2003) Curr Opin Pharmacol 3, 371-7.